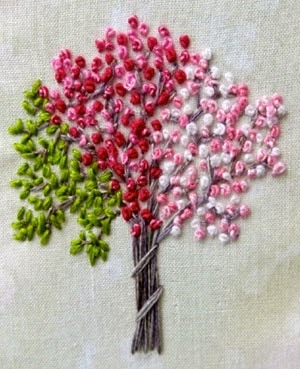 The above is a great little tutorial for a French Knot.... You can do beautiful flowers with that stitch. When I am embroidering lavender I use this stitch as when they are in a cluster in the shape of lavender it really looks very good. You can embroider a border of flowers with French Knots and some other simple stitches and it makes a stunning cottage garden border or indeed a tree! Have a go yourself. Do not forget though, put your linen into a hoop to keep it taught and then your work will be neat and it will be easier, especially with a French Knot. Yes I thought I might do a stitch a week maybe ...... So I hope you like them.